How Do You Solve a Quadratic Inequality Algebraically? 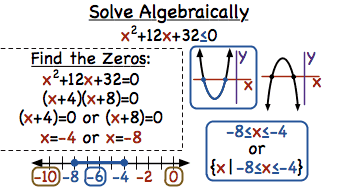 Solving quadratic inequalities can be fun, especially when you use algebra to help! Follow along with this tutorial and see how to find critical values and use them on a number line to find the solution to the inequality! If you graph a linear function, you get a line. If you graph a quadratic function, you get something called a parabola. A parabola tends to look like a smile or a frown, depending on the function. Check out this tutorial and learn about parabolas! What is a Quadratic Inequality? A quadratic inequality is just like a quadratic equation, except instead of an equal sign there's an inequality! Check out this tutorial to see the characteristics of a quadratic inequality and get some practice identifying them. The critical values of a quadratic inequality are also the x-intercepts of the corresponding quadratic equation. This tutorial provides a great explanation of the critical values of a quadratic inequality!